Along with the kitchen, the bathrooms offer the best return on dollars invested in a renovation. And one of the easiest ways to update your bathroom look is to replace the vanity, countertop, sink, and faucet with a clean-looking new unit. For a few hundred dollars you can make your bathroom look like a million bucks. The first step in this easy renovation is to remove the old vanity, but the next step is to install the new vanity, countertop, and sink—the subject of this article. Vanities most commonly come in two styles: vessel style and cabinet style. After you buy the vanity and take it home, carefully cut open the box, following the instructions are shown on the carton to ensure that you don't damage the finish of the vanity cabinet. Usually, when you buy a vanity kit, it will include the base cabinet as well as the countertop and sink that are separate from the cabinet. There may also be a separate backsplash piece. Remove all the packing and place the countertop/ sink unit upside down on the carpet or some other soft surface to protect it until you need it. Your vanity needs to be firmly anchored to wall studs, so the first step is to find the position of those studs in the wall behind the vanity cabinet. Using an electronic stud finder, locate at least one wall stud on the wall behind the vanity location. Mark the center of the stud. Repeat the process to find a second stud if possible (studs are typically 16 inches center-to-center). If the vanity is boxed in by a side wall, also find the wall studs in the side wall. Mark the height of the top of the vanity base cabinet on the back wall (as well as the side wall if you have a corner installation). If no dimension was provided in the instructions, measure the actual cabinet and use that dimension. Measure from the floor to the top of the base cabinet (not including the countertop). Use a standard level to lightly mark the wall at the height of the vanity cabinet. Once the height is marked off, place the vanity cabinet into position. If the vanity is anchored to the back wall only, make sure to position the cabinet so that the vanity top will have an equal overhang on each side. If the vanity will be boxed in by a side wall, too (as in our demonstration), place the vanity cabinet so the countertop will touch the side wall and overhang on the opposite side. (You will have to test fit the countertop to determine this). With the vanity in position, use a level to ensure the vanity is level both side-to-side and front-to-back. If necessary use wood shims driven under the cabinet to level it. Secure the cabinet to the back wall with two 2-inch wallboard screws driven through the mounting strip in the back of the cabinet and into the wall studs. Where the cabinet is positioned against a sidewall leaving a gap to be filled, you will need to measure and cut a narrow filler strip to fill in this gap, as shown here. This may involve shaping the filler strip to fit around a baseboard or coved tile piece at the bottom of the cabinet. You will first cut a filler strip, then scribe the profile of the baseboard onto the strip, then cut out that profile so the filler strip fits perfectly in the space. Cut a filler strip to the overall length and width of the gap between the cabinet frame and the side wall. Some vanity kits may come with filler strip material made of the same material as the face frame of the cabinet. Or, you may need to buy wood stock of the same type as the face frame, then cut it to the right size and finish it to match the cabinet. Trim the filler strip to the width of the gap. If you have a curved cove base tile as shown here, use a small profile gauge to "copy" the profile of the baseboard. Transfer the shape onto the wood filler strip by tracing it with a pencil. Using a manual coping saw or jigsaw, carefully cut out the shape of the cove base from the filler strip. Test-fit the filler strip and adjust as necessary. Once the filler strip fits precisely, sand, stain and finish the wood strip to match the base cabinet face frame. Attach the filler strip to the cabinet with screws driven through the inside edge of the cabinet face frame and into the edge of the filler strip. Ideally, the filler strip should look like a continuation of the face frame. Although this step is sometimes omitted, it is best to anchor the side of the vanity cabinet to the side wall, as well as securing the cabinet to the back wall. But because there is a gap between the side of the cabinet and the wall, you'll need to shim out the gap for support before driving screws. Cut two wood spacer blocks to a width about 1/8 inch short of the distance from the vanity side to the wall. Place two wood shims between the wood spacer blocks and the wall, driving them together slightly to create a snug fit. Drive a drywall screw into the cabinet side and into the wall at a stud location, making sure the screw is long enough to extend about 1 inch into the stud. If the sink is separate from the countertop rather than an integral piece, attach it to the countertop before installing the countertop on the vanity. Also, attach the faucet and drain fittings. It is much easier to install these components on a detached countertop than do it after the countertop is in place. Place a small amount of silicone sealant/caulk on the bottom surface of the countertop at each corner, where it will rest on the cabinet. Then set the countertop/ sink assembly in place onto the cabinet. If the vanity is installed just against a back wall, make sure countertop overhangs equally on each side. If the cabinet is boxed in by a sidewall, as well, but the countertop tightly against the side wall, with the overhang falling on the open side. Make sure the vanity top is now in the final position you desire, with the back of the countertop firmly against the back wall. It is not usually necessary to anchor the countertop to the cabinet in any other way since the silicone caulk will bond it to the cabinet. Some vanity kits, though, come with brackets that screw to the bottom of the countertop from beneath the sink. If your vanity came with these brackets, attach them now. Once the countertop assembly is in place, hook up the faucet water supply. How this is done will depend on the style and manufacturer of your faucet, but essentially it involves connecting flexible supply tubes to run from shutoff valves to the tailpieces on the faucet. Also, connect the drain trap fittings to the branch drain from beneath the sink. Apply a bead of silicone sealant/ caulk in a serpentine pattern on the back of the backsplash. Press the backsplash firmly into place against the wall. Install a bead of silicone caulk along the cracks between the backsplash and the wall, and also along the crack between the bottom of the backsplash and the countertop. Let the caulk cure 24 hours. 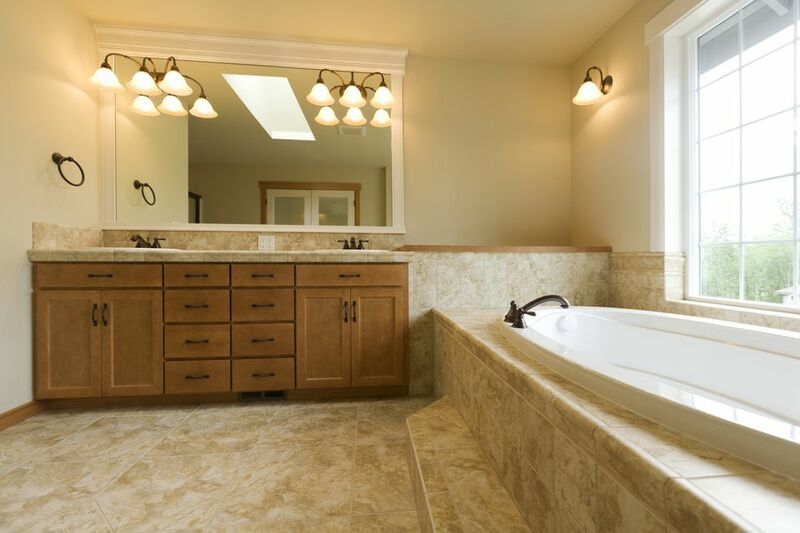 If you have a granite or marble vanity top use a stone sealer before using the vanity. Once your vanity is fully installed, take a step back and enjoy your hard work!